You can also view the City Botanic Gardens image slideshow. The Bamboo Grove is a collection of 23 bamboo species. It was planted to commemorate the bamboo collection that was lost in 1937. This occurred when the gardens' Fern Island attraction was drained and filled as a result of mosquito complaints. In 1862 12 cannons, cast between 1797 and 1810 by the Carron Company ironworks in Scotland, were sent to Brisbane on the immigrant ship Clifton. The cannons were provided to defend the new colony of Queensland and were originally set up in Queens Park (now part of the City Botanic Gardens) as a firing battery on the bank of the river. This cannon, serial 63914, was cast in 1803. In 1909 it was moved from Queens Park to Cameron Rocks Reserve by Hamilton Town Council. In 1954, it was relocated again and set up at the Bulimba power station on Gibson Island. In 1982 it was swapped with another cannon restored by the Naval Cadets. The cannon was reinstated in the City Botanic Gardens in 2015. It faces the Brisbane River next to the pathway near the Alice Street entry. Queensland artist, Lindsay Daen, created this bronze sculpture. It's on permanent loan from the Queensland Art Gallery. The sculpture is of a 22 year old seaman, Jemmy Morrill, who was the sole survivor of a shipwreck on the outer edge of the Great Barrier Reef in 1846. Aboriginal people found him and he lived with them for 17 years before returning to a European settlement in the Bowen district. He went on to play an important role in improving relations between the Aboriginal people and early settlers. Harry Oakman, former Manager of Brisbane City Council's Parks' Department and landscape architect, designed the top ornamental pond. It was created between 1958 and 1960. The lower ornamental pond was part of the City Botanic Gardens' original natural creek system. 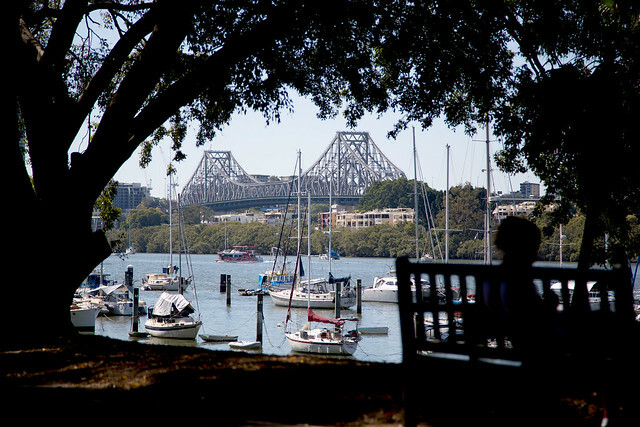 This area provides great walking and cycling opportunities to make the most of the gardens' location on the Brisbane River. Since it was opened in 1989, over 1.5 million people have enjoyed the Riverstage. It's estimated that 100,000 people attend events here each year. In 1867 the Walter Hill drinking fountain was built to provide much needed drinking water to the public. It was built at the time of the first reticulated water supply in Brisbane. The fountain was used until 1930 when new bubble fountains were installed. These were more hygienic than drinking with a cup, which was the case with the ornamental fountain. Water to the ornamental fountain was turned off and remained inoperable until recently. In 1972 the fountain was named the Walter Hill Fountain as a tribute to the first gardens' curator. A plaque was attached to its base. In 1995 conservation work took place and in June 2005 the fountain was once again open to the public. The Weeping Fig Avenue was planted in the 1870's as a barrier between the northern boundary of the City Botanic Gardens and Queen's Park.